Last week the popular website IO9 ran a tongue-in-cheek story headlined, “Could Humans Have Evolved From Dolphins?” While posted in fun, originally the humor wasn’t entirely clear (it has since been updated), so the story caught ire of some of the scientific blogging community. So where did this idea come from? And more importantly, why is it still around? The idea of a human water origin goes back to 6th century Greeks and has been revived in several forms since. In recent modern times the proposition that humans may have spent some time as sea mammals, was first brought to light in popular press by zoologist Desmond Morris in his 1967 best seller, The Naked Ape: A Zoologist’s Study of the Human Animal. There, in his unabashed exploration of the human animal as a zoological curiosity, Morris suggests that there is one “ingenious theory” that could explain our lack of body hair, streamline bodies, upright posture, and several other anatomical anomalies that separate humans from all of our primate relatives. That “ingenious theory”, now referred to as the Aquatic Ape Hypothesis (AAH) or Aquatic Ape Theory (AAT), was first considered by Antarctic Marine Biologist Sir Alister Hardy. Hardy proposed that there was a time in human evolution when we were aquatic apes—creatures of the sea. Hardy was aware that his proposition was far from the mainstream – so far in fact, that he sat on it for almost thirty years. Finally, however, he broke his self-imposed silence and tentatively presented his thoughts at a conference of the British Sub-Aqua Club in Brighton, England in March of 1960. The swift publicity surrounding his speech surprised Hardy, but the popular press’s “abbreviated” treatment of the topic worried him. Fearing he was being misunderstood and eager to clarify his views, Hardy gladly accepted an invitation from New Scientist magazine to present his theory in full. 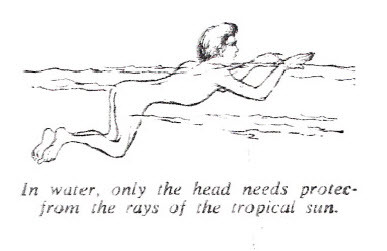 On March 17, 1960 his article, Was Man More Aquatic in the Past? was published. In that article, Hardy paints a picture of our primate ancestors being forced out of the trees and onto the sea coast by stronger competitors and predators. He supposes that at first we ventured into the shallows crouched on all fours digging for shellfish and other easily-gathered prey. Eventually we may have stood upright for “hours at a time” as we tried to avoid submersion while wading into deeper water. Finally, we became adept at swimming. Only after improving our tools and hunting techniques would we, the now aquatic apes, have been sufficiently equipped to venture back onto land and into the savannah. In the evolutionary process, Hardy surmises, we would have lost most of our body hair in the way of dolphins and whales. As we pursued deeper and faster prey we would have developed a more streamlined body than other primates. This brief observation was enough to trigger Hardy, an expert in Antarctic biology, to think about blubber – that thick layer of fat that insulates and protects marine birds and mammals. Hardy realized that an aquatic origin would answer the question of the body fat along with many of the other questions that had been raised about the differences between humans and our brethren, the great apes. The more Hardy thought about an aquatic origin, the more it seemed that this theory could be a missing link in our understanding of human evolution. In the end, Hardy’s thesis was politely ignored by the scientific community. In fact, it probably would have fallen into obscurity if not for Desmond Morris and subsequently, a little-known Welsh television screenwriter – Elaine Morgan. Although not trained in science, Morgan was no slouch academically. She held a degree in English from Oxford. She was a screenwriter of enough talent to merit a tidy collection of prestigious awards. She was inquisitive enough to have read Morris’s book and then bold enough to publicly question it. Human fat akin to blubber? Hardy thought so. Morgan took issue with Morris for being too male-centric in his assumptions about how humans evolved our unique behaviours and phylogeny. In her mind, his explanations elucidated nothing about why women evolved many of the same attributes as men and why both sexes are so different from other apes. As a challenge to Morris’s assumptions, Morgan wrote her first book, The Descent of Woman: The Classic Study of Evolution (1972) where she publicly took him to task. But despite her differences with Morris’s theses, there was one point on which she and Morris were in agreement – on that “ingenious theory.” In that one short passage Morgan recognised a truth—that the Aquatic Ape Theory, if proved out, would shake the foundation that supports all of our current thinking on human origins. That premise, Morgan decided, neatly explained everything that makes us unique as primates— our hairlessness, our bipedalism, our streamline bodies. From the moment of that realization Morgan became a passionate promoter and, for the next forty years, the sole torchbearer for the AAT. When The Descent of Woman was released, Morgan braced herself for backlash. She knew her criticism of Morris was tendentious, but it was, after all, 1972. Women’s Lib was in the air. In such a zeitgeist she would not have been surprised if 50% of the population disagreed with her. But her real anticipation was over her discourse on the AAT. For this she expected criticism of the scientific sort. First, she foresaw an attack on her qualifications to even address the subject; who was this screen writer pretending to know a thing or two about evolution and human origins? She also recognized that her attitude in her book was, at best, flippant and that her research was superficial. She assumed that the scientific community would step forward en force to tear down her entire thesis. Instead, like Hardy, Morgan was ignored. A savvy woman, Morgan knew better than to take this as a win. Silence in the scientific world is an ominous sign, not a victorious one. Besides, she was looking for scientific scrutiny. She wanted enough critical response so she could either concede that she was misinformed or build a better case. Since neither of these happened, and because she’s not the type to crawl quietly back into her hole, Morgan decided to take up the cause in earnest. The Aquatic Ape carried a more serious tone than Morgan’s previous book and supplied what she considered to be more evidence in support of the AAT. Again, to her surprise and dismay, her work was met with silence from the academic community. Hot and dusty human origins? But the public was captivated. By 1987 Morgan had generated enough interest in the theory that a conference was organized by the European Sociobiological Society and the Dutch Association of Physical Anthropology. Held in Valkenburg, Netherlands, the purpose of the conference was to try to determine which niche humans must have filled in order to evolve so differently from other apes—was it the savannah or the sea? Raymond Dart’s savannah hypothesis was the prevailing theory at the time. For this reason, AAT was held up as a competing theory to Dart’s—“Cold and Watery” or “Hot and Dusty” was how anthropologist Vernon Reynolds phrased it in the title of his summary of the proceedings. The conference was well-attended by enthusiasts representing both sides of the argument, with lines forming outside the doors to many of the popular lectures. Twenty two participants representing the full range of support and opposition to AAT presented papers. Together they covered such topics as primate behaviour, marine ecosystems, geophysical history, cultural anthropology, and physiological differences between apes and humans. After a long day of civil disagreement in what the authors of the proceedings called a “fair and friendly atmosphere” the scientists ultimately came down on the side opposing the Aquatic Ape Theory. As summed up by Vernon Reynolds, “while there are a number of arguments favouring the AAT, they are not sufficiently convincing to counteract the arguments against it.” In fact, several former supporters of AAT concluded that the evidence against the theory was stronger than that for it. So that should have put an end to AAT. What Morgan doesn’t seem to realize is that with so many hundreds or even thousands of trained eyes looking at AAT over the last forty years, if it held any water at all, a good number of anthropologists would have excitedly jumped on board. Instead, while her credentialed supporters include the likes of medical doctors, geologists, geographers, and nutritionists, none are paleoanthropologists—the very experts she is hoping to sway. When I first read about the Aquatic Ape Theory, I was skeptical. More than skeptical – I rejected the idea outright. If humans had passed through a portion of our recent evolution in the sea, why weren’t scientists talking about it? And besides, who was this woman? The term crackpot came to mind. Or opportunist—she certainly has sold a lot of books on the subject. How can she know more than all the scientists who have been studying human origins for the past century? (Always a pseudo-science red flag) I was prepared to join the rank and file of detractors and grant her a single dismissive paragraph when I started this piece. But then I watched her 2009 TED lecture – and I liked her! Sure, I still reject her theory, but Morgan is easy-going and engaging. She’s funny. She’s smart. She comes across as anything but a crackpot. And that charisma has everything to do with why her long-debunked idea is still circulating. It got her on TED didn’t it? It’s not her theory everyone loves –it’s her. Is the Aquatic Ape Theory fairly described as pseudoscience? Every statement of natural causes is potentially scientific. What distinguishes science from pseudoscience is social. Pseudoscience is supported by assertions of authority, by rejection or ignorance of pertinent tests, by supporters who take on the trappings of scientific argument without accepting science’s basic rules of refutation and replication. Pseudoscience is driven by charismatic personalities who do not answer direct questions. When held by those in power, like Lysenkoism, it destroys honest scientific inquiry. When held by a minority, it pleads persecution. I think that the Aquatic Ape Theory in 2009 fits the description. So yes, the water is lovely Ms. Morgan. Entirely lovely. But it was never our home. NextFriday Fiction Facts: Trapped in an airtight room! I’ve read quite a lot about the Aquatic Ape Theory, and in my opinion the Savannah folks have a raging case of “Not-Invented-Here”. Science-by-ridicule – what that Hawks fellow is doing – isn’t very persuasive. I predict many aspects of the AAT are going to become mainstream someday. Well Kim you’ve done it again. As always I so enjoy reading your blog. The topics you choose are interesting; your writing witty, insightful and thought-provoking. Love it! Fascinating, I heard about this theory a while ago and thought it sounded a little wacky, but I don’t actually know anything about it. Is there a scientific summary somewhere explaining the evidence for and against? Or at least the major criticisms of AAT? thecellularscale, I’m with you in hoping a ‘qualified’ somebody who can write well turns up some “major criticisms” of the AAT. All I’ve managed to do is to locate a non-expert person who (to his own satisfaction) has absolutely demolished the theory. His very long beatdown establishes that the AAT is an absolute crock, and those who espouse it are slippery rascals who play fast and loose with the facts. Why haven’t the ‘credentialed’ pros spent more time stomping the theory? From what I can make of the link-author’s remarks, life is too short and the AAT advocates are too dishonest. Still, I own books by professional scientists who’ve raked Creationists and GW Deniers across the coals. If some acknowledged expert hasn’t done the same with the horrible AAT, it would strike me as very odd. @Jocelyn – Thanks so much. Am glad you stopped by. @Zachary and @thecellularscale, thanks so much for adding to the discussion here. John Hawks (at the link in the article) provides a summary of why the AAT is not accepted in the scientific community. Zachary, you’ll notice he agrees that the Savanna Hypothesis is no longer considered tenable. Understand that scientists, by nature, LOVE a new theory. Everyone wants to be part of a breakthrough! If the AAT had been at all scientifically sound, paleoanthropologists would have been all over it. They would have tested it, presented some sound science behind it, and a good scientific debate would have ensued. Why didn’t that happen? Because the AAT has never been presented scientifically. Nobody has done a study that shows its existence. Lots of observation and correlation, yes, but no concrete science. This makes it impossible to argue scientifically. That’s the problem with proving a negative — and that’s the problem with the AAT. Elaine Morgan and other ATT supporters are asking science to prove them wrong, instead of doing their own studies to put their theory to a real scientific test. Kim, AAT has been a failed theory from the very beginning, so I can’t imagine a better way to destroy an academic career than to begin to speak in favor of it. Prudent people haven’t and still don’t embrace it. In my opinion they’re wise to do so. Why portray yourself as a crank when the only result will be getting shut out of research funds and promotions? My second link author got really bent out of shape by the comparison of the AAT to Continental Drift. The notion that the solid rock we live on could be ‘drifting’ around was absurd to level headed folks, and like with the AAT, I don’t see any way Wegener could have done any more than he did in the way of research. The necessary tools simply didn’t exist during his lifetime. The AAT may yet turn out to be a crock of crap, but many of the pieces seem to fit, just as those continental jigsaws Wegener saw fitted together. New discoveries (fossils and who knows what else) will either kill it dead or make it part of the mainstream. Personally, I expect those future discoveries will be unexpected ones out of left field – much like imaging sonar and paleomagnetism were to Continental Drift. BTW, although I do not have formal academic credentials in the subject (just like the AAT/H’s major proponents) many people who do have such credentials, if formal credentials matter to you. And I wrote an entry on the subject for the Sage Encyclopedia of Anthropology. Zach, you are not being very smart if you have swallowed Jim Moore’s gossip so uncritically. Please read my critique of his masquerading web site. Note that whereas Jim has just six (out of nearly 70,000) words about my critique, almost every page of mine points to the corresponding page on his, so that readers can check for themselves. Yes, it was very sad. I met her just a few months before she died. As cheeky, bright and perky as ever. Please cite the paper where any waterside hypothesis of human evolution (there are several, you know) was “scientifically discredited”. See, as someone who has studied bipedal origins to PhD level for over twenty years I’m still waiting to be pointed to any paper that even discusses, let alone scientifically discredits, the wading hypothesis. Isn’t scientific progress supposed to be made through the literature? Or is gossip sufficient, as long as the majority of anthropologists are united in sneer review. Thanks a lot, Algis. Hawks clearly has no idea what he’s talking about. Elaine agreed that the term “aquatic ape” was a misnomer. Better terms are Littoral Theory, or Coastal Dispersal Model, google “greg laden blog verhaegen”: rather than running over savannas, Pleistocene Homo populations followed coasts & rivers, collecting different waterside & shallow aquatic plant & animal foods. There are still a lot of misconceptions & unproven assumptions about our semi-aquatic evolution (so-called AAT), not only by AAT opponents, but also by some proponents. “It” didn’t happen 6 or more mill.yrs ago as Elaine thought, and “it” has nothing to do with apes or australopiths or even habilis, but it is about archaic Homo, eg, most erectus fossils are typically found amid shellfish (even marine shells) and show unmistakable convergences to littoral species (pachyostosis, platymeria, platycephaly, ear exostoses, intercontinental dispersal, projecting nostrils etc. ): no dobut their lifestyle included diving for shellfish when they followed the coasts as far as Flores, the Cape & Pakefield.